Looking for an elegant gift for a special occasion? 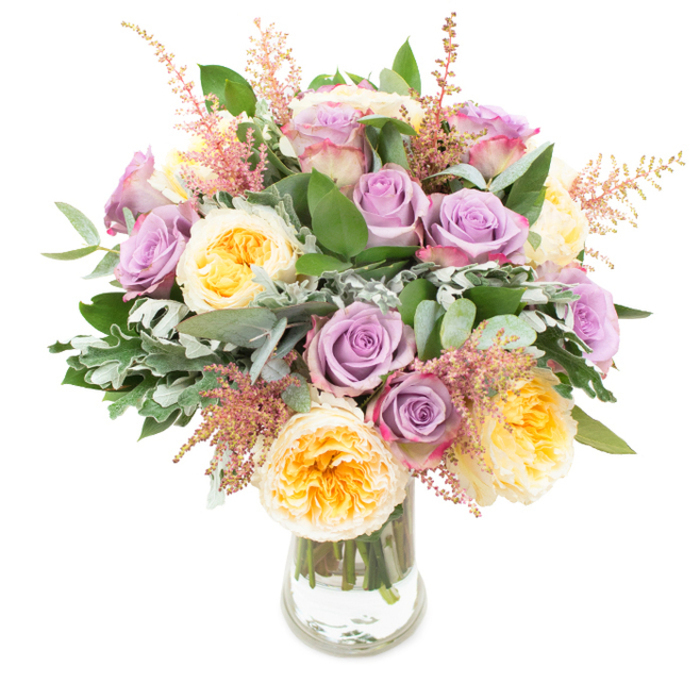 We offer you a classy bouquet made from gorgeous purple and white roses, pink astilbe, eucalyptus leaves, senecio and ruscus that will certainly add vibrant colour and elegance to any room. I love the colour and smells and all the different breeds in my bouquet. Overjoyed with them. When I looked at this bouquet I thought of summer and spring and my heart immediately felt warm and full. Perfect, didn't have to worry about anything. Thank you for the friendly correspondence via email. Your team is the best! I really appreciated the beautiful flowers that were delivered along with the balloon and the vase. It was pretty easy to order. Will count on you for flower delivery again! Beauty and elegance in one perfect arrangement! Timely delivery. Great service that I'll definitely use again. The flowers arrived in perfect condition. Good job Handy Flowers. Thank you for delivering the flowers on time! Much appreciated! Stunning flower combinations, vibrant colours and great attention to detail! Glad I chose this online flower delivery shop – they delivered superfast and everything was top notch. The bouquet was breathtaking! An incredible display of creativity and skill!